Earthquakes of the SE United States shows epicenters of earthquakes which have occurred in the southeastern United States between 1698 and 1997. U.S. Geological Survey offers an online collection of resources to support teaching, learning, education (K-12) and university-level inquiry and research. Discover a wealth of curricular ideas, scientific data, maps, books, lessons, and other resources to support earth science, biology, geography, and hydrology. This four-page informational brochure contains selected online resources to support teaching, learning, education (K-12) and university-level inquiry and research. For more information, contact the USGS Science Information and Library Services at 1-888-ASK-USGS. 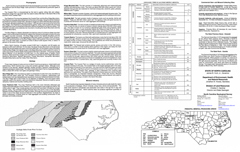 The Generalized Geologic Map of North Carolina (11"x17", 1991) is a two-sided download. The front shows the color-coded geology complete with a legend of basic geologic rock types. The back provides an overview of the physiographic provinces, general geology and the geologic time scale as it relates to North Carolina. This map is based on the 1985 Geologic Map of North Carolina (1:500,000-scale; 42x68 inch). Interactive geologic map hosted by the U.S. Geological Survey. The paper plot of this map is at 1:500,000-scale; 42x68 inch. 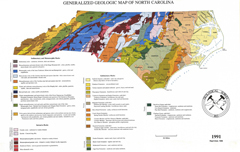 This map shows more detail than the Generalized Geologic Map of North Carolina available above. Crushed Stone in NC provides an overview of crushed stone (aggregate) resources and production, plus a virtual tour of an aggregate operation. Building Stone of NC provides an overview of building stone resources, plus a virtual tour of an building stone (dimension stone) operation. Mineral Resources of North Carolina explains this important part of North Carolina's economy. Send questions about earth science education to Dr. Kenneth Taylor with the N.C. Geological Survey. We encourage students to send in questions but we will not write reports or answer test questions. This is not a substitute for studying or library research.